Have You Paid Your Van Tax? The case of a tradesman in Powys was brought to our attention recently. On the way to his first job of the morning, he was pulled over by the police as the road tax on his van had run out. So sure was he that he was up-to-date with his online renewal and payments, he invited the police back to his home to check out his computer and online bank statements. Much to his amazement and embarrassment, it became clear that the renewal he thought he’d completed online hadn’t gone through and his van was indeed untaxed. The van was immediately impounded and he had to ring the customers he had booked in for that day to explain why he wouldn’t be turning up. The loss of a day’s earnings was further compounded by substantial penalties. As well as the on the spot fine, he had to make a back-payment for the tax he owed, re-tax the van for the next 12 months and then pay to get the vehicle out of the pound. Vehicle Excise Duty (VED), more commonly known as road tax, is a fee that must be paid in order for any vehicle to legally drive on public roads in the UK. All vans must have up to date insurance and a valid MOT certificate (if they’re more than 3 years old) in order for a VED to be paid when due, so it’s important to keep renewal dates for MOTs and insurance in mind too. In the case we’ve just quoted, a technical slip-up on the computer, lead to a great deal of trouble, but now we no longer have paper tax discs on our windscreens to act as a visual reminder, it’s easy when you’re busy, to forget where you are. A few weeks before the tax renewal date, the DVLA will send you a v11 reminder, so that you can re-tax the vehicle online or at the post office. 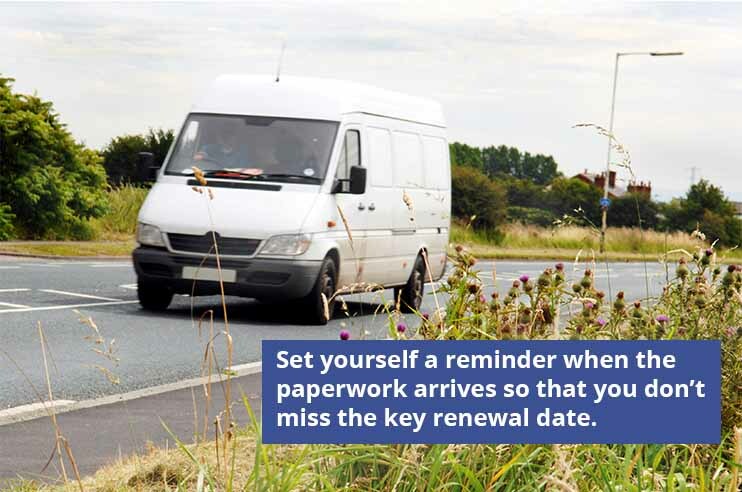 Set yourself a reminder when the paperwork arrives so that you don’t miss the key renewal date. In order for you to receive these v11 reminders, it’s important that the DVLA has your current address. It’s a legal requirement to let them know when you move. A section of your paper licence needs to be completed with your new address and the whole licence returned to the DVLA so that your records can be updated. I don’t have my v11, what can I do? If, for some reason, you don’t have your v11 reminder to hand, you can still tax your van online or at the post office if you have the logbook/V5C documentation. If you don’t have these documents, it’s still possible to pay the tax, but you’ll need to visit the post office to do so – and you will also need to apply for a replacement V5C. For more details on how to renew your VED without the v11 reminder click here. The road tax for vans registered before 1st March 2001 is calculated on engine size, the same as for cars, but newer vans, registered after 1st March 2001, are taxed on weight with most under 3,500kg attracting an annual fee which is currently £240. You can pay for 12 month’s tax up-front or if you’d prefer to spread the cost, you can pay either six-monthly or monthly via direct debit, but it’s worth noting that there is a 5% surcharge if you choose to pay this way. Want some more tips on running your business?